Changes in climate and climate variability will affect livestock production systems in all parts of the world, and will inevitably impact the 1.3 billion poor people whose livelihoods are wholly or partially dependent on livestock. At the same time, livestock production is a major contributor to greenhouse gas emissions, putting pressure on livestock keepers to mitigate emissions as well as adapt to change. The livestock sector has a key role to play in achieving a balance between food production, livelihoods, and environmental objectives. The livestock sector cannot be studied in isolation – an integrated approach is required. 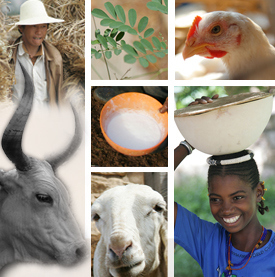 Ongoing work on livestock futures will have a role in shaping the development agenda. Such work should help to influence and positively direct future discussions about livestock in a changing climate and their critical importance in sustaining hundreds of millions of poor people in developing countries. 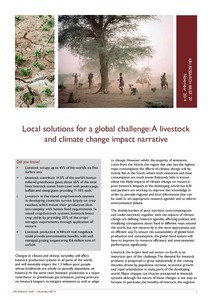 Download a brief that illustrates how recent research by ILRI and its partners has significantly advanced the understanding of livestock systems, and particularly in relation to the environment and climate change.